All our quartz sand is dyed at Stonewalk, where we can handle 25 tonnes a day. 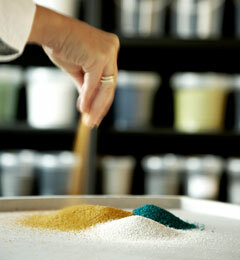 The dye and quartz are mixed in large vessels and the material is heated. We screen the product before it enters the dyeing facility as well as after dyeing. Screening the stones before they enter the production facility removes dust. 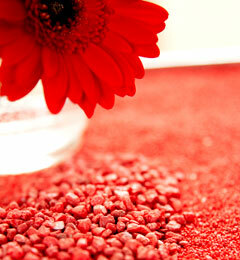 Excess dust attracts dye, making the production more costly. Some crushing takes place during the dyeing process, but the residue is removed during the subsequent screening. The warm sand is fed through a cooling facility into silos where it is then ready for mixing and bagging. 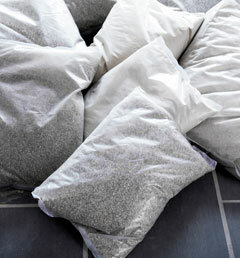 We bag in 25 kg bags or big bags depending on requirements. Each production is unique, and very small variations in shade may occur. Therefore, we always produce a little more than customers request, because in our experience customers often need ‘just a little bit more’. In the case of orders for mixed colours, the correct volumes of the different dyes are taken to our mixer and then the customer’s order is bagged. After each production run, the entire plant is cleaned so it is ready for a new production with a new colour. In parallel with our traditional production, we run a number of trials in an attempt to identify the best dyeing method and the correct materials. Here, we focus in particular on production costs for heating as well as the impact on the environment. Our products are non-harmful, but as with any other production, waste is created during the process, and this is what we are trying to reduce. All our production runs are subject to production control, i.e. we check that our dyeing corresponds to the master colour.